Seller will consider all offers and is willing to consider a kitchen concession! Breathtaking views from every room! Largest frontage on Lake Huron & is very private. Beautiful landscaping, accent lighting surrounding, 110 & 220 through seawall to lake for hoist, invisible fence, parking w/ room for a boat, etc, 2HP water pump for watering from lake, & stream running through property. 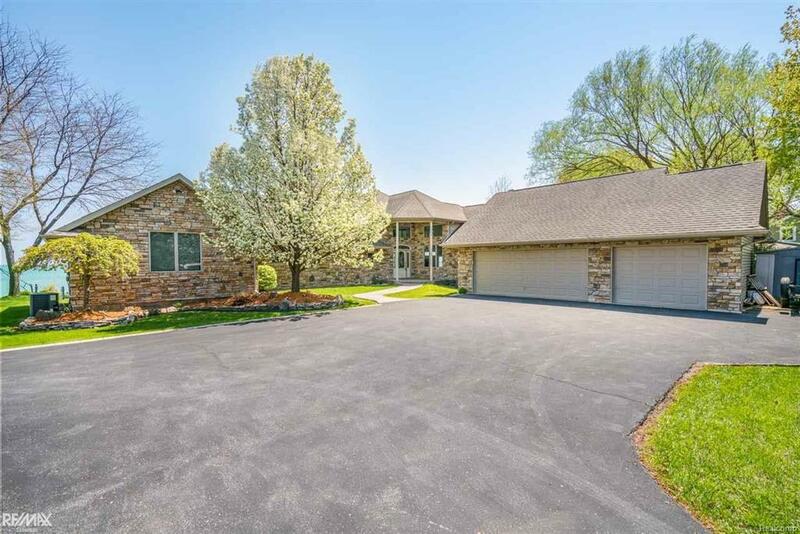 Cathedral ceilings, remote controlled skylights, loft overlooking living room w/ door to 2nd story deck, loft above 2nd bedroom, natural fireplace, finished basement w/ bath and 4th bedroom plus an additional room that be a perfect office or exercise room. 3 forms of heat (radiant, hot water baseboard, forced air). Each room temp can be adjusted keeping utility bills LOW. Island area has 120 & 200 w/ downdraft system. R-53 insulation rate, dry lock drain system (transferable), 2 200 amp service panels w/ 24 breakers in each. 3 car garage has a/c & heat, 220 & 110 & overhead storage. No flood insurance!